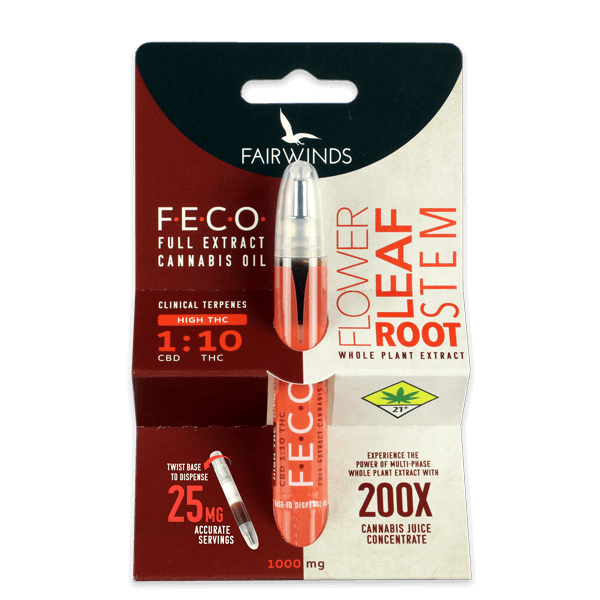 Fairwinds is proud to introduce Washington’s first Fully Extracted Cannabis Oil! Utilizing an innovative multi-phase extraction process, our laboratory has created a comprehensive whole-plant blend setting a new standard for cannabis concentrates. This ground-breaking production process captures a rich profile of essential cannabinoids, terpenes and organic compounds normally left out in typical RSO. The additional extraction process yields components such as alkaloids, flavonoids and polysaccharides commonly found in cannabis juicing. A single gram of our juice concentrate is equivalent to 200 grams of fresh whole cannabis plant! 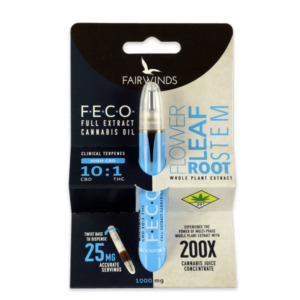 Leaving the old-school syringe in the past, the FECO now comes in an easy to use discrete pocket pen that guarantees a 25mg serving size with a simple click! Note: This product has not been approved by the FDA to treat, cure or prevent any disease. The 1:10 CBD to THC ratio provides a potent cannabis effect with each serving delivering a hefty dose of THC. A small amount of CBD from the ACDC strain synergizes to improve the benefits of THC. The oil is blended with clinical terpenes to provide an optimal experience. Cannabis Oil, Cannabis Juice Extract, Cannabis Terpenes, Glycerin Flakes. Contains: Cannabis constituents extracted by food grade hydrocarbons and purified water. Caryophyllene, Nerolidol, Terpinolene, Terpineol, Limonene, Delta-3-Carene, Pinene, Proprietary Blend. Alongside many of the leading minds in cannabis research, we find it necessary to establish a new classification of how we think and talk about the effects of cannabis! By adding to the standard nomenclature with the term “Clinical Terpenes”, we aim to draw more attention to the individual effects of each fantastic terpene! Within this Clinical Terpene blend, you may find some of the very same terpenes known to be found in Indica or Sativa cannabis. For example, Limonene is commonly found in many uplifting Sativa strains. However, clinical studies on Limonene have shown much greater benefits than just a simple energy boost. Data has shown this terpene to reduce stress as well as increase the absorption of other terpenes and cannabinoids! – Remove the cap and firmly twist the base of the pen clockwise to break the child proof seal. (There is no need to remove the perforated wrap). 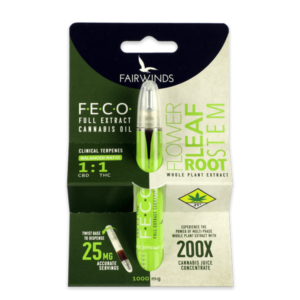 – With the cap off, prime your FECO dispenser by pointing the stainless-steel tip up & twisting the base clockwise (this will purge the air and bring the oil to the top). Each rotation will make a clicking sound. (NOTE: Dispenser should be held with stainless steel tip up until oil is level before attempting to prime). – After the cartridge is primed, rotate an additional full rotation until it clicks for your first serving. Occasionally the first serving can be less than 25mg. – Slightly the rotate base counter clock-wise after dispensing to pull the oil back into tip to avoid spillage and replace cap. Replace the cap when not in use. – Enjoy the next level of wellness! Thank you for being a part of the Fairwinds Family! [Note] For those sensitive to flavor, CBDA, THCA & terpenes can sometimes provide a mild bitterness. To reduce this impact, try storing each serving in a cellulose capsule for easy access and use!